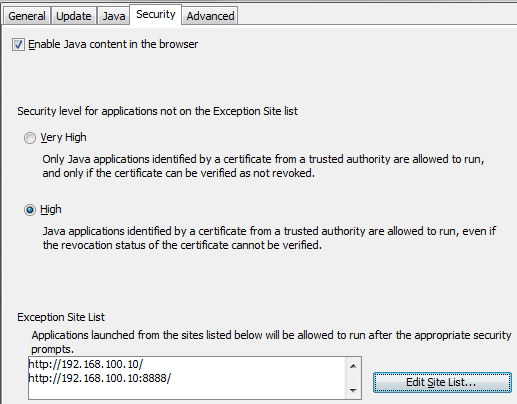 you want to launch a Java Applet and you get an error like this AccessControlException => java.net.SocketPermission” “192.168.100.10:8888” “connect,resolve. This error typically occurs when you start an applet and this applet want to open a socket connection to an different IP Address or TCP Port as the applet came from. Since Java 8 such action would blocked. But there is a workaround to get this running. Then open the java.policy file located in the subfolder lib\security at the Java installation folder and add the following string to the grant section, replace 192.168.100.10:8888 with your IP Address respectively TCP Port. I am unable to make changes in the JAVA policy. its says access denied. please help me to resolve the same. Right click and run notepad.exe as an administrator. Then browse to and open the java.policy file and make your change. Make sure you’re looking for all files.